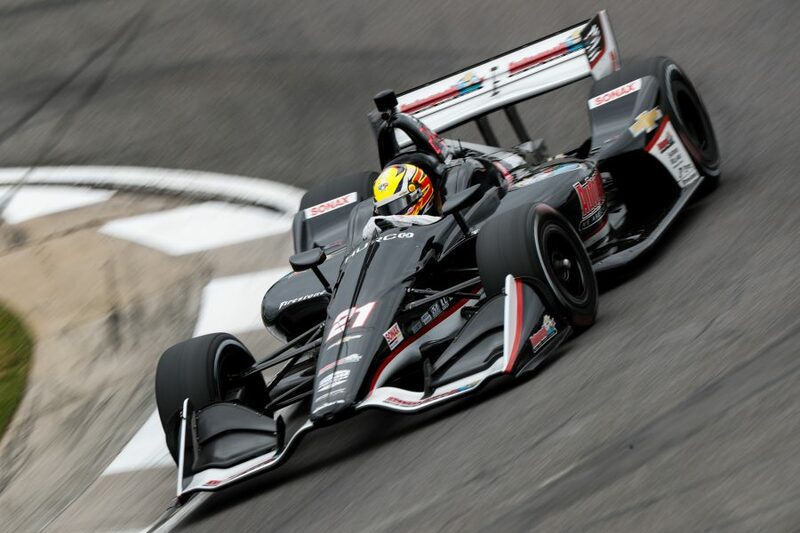 – For the first time in his NTT IndyCar Series career, Spencer Pigot advanced to the Firestone Fast 6 and parlayed a career-best starting position of 6th into a bold-two stop strategy in the Honda Indy Grand Prix of Alabama. However, the timing of the day’s only yellow flag, followed by a penalty, dropped him to the back of the field. Though it had been shaping up to be a promising day, Pigot would finish 17th . – On Saturday afternoon, Pigot’s Round 1 qualifying lap of 121.133 mph ultimately become the fastest of all rounds of qualifying. A quick lap of 120.708 mph in Round 2 had him sitting second and he easily advanced to his debut Firestone Fast 6 session. Pigot’s ultimate starting position of 6th on the grid matches his career-best to date. His previous best road course start was 9th at last year’s INDYCAR Grand Prix at the Indianapolis Motor Speedway. – Pigot chose to start the 90-lap race on Firestone’s alternate red Firehawk tires. He lost one position at the start, but settled into a comfortable rhythm in 7th. Pigot cycled up to 2nd as he was one of two cars to begin looking at a two-stop strategy, staying out while the top five cars made their first stops. – Pigot saved enough fuel to stretch his first stop until Lap 28, though he was passed a few of the initial leaders on fresh tires prior to pitting. He came in to the pit lane from 6th, making a switch to sticker blacks. He rejoined the race in 17th, but quickly began to cycle back forward. By the halfway point of the race, Pigot had made his way back up to the 8th position as the highest-running Chevrolet driver. – On Lap 56, a car slowed on course. Anticipating a full-course caution, Pigot dove into the pit lane for what was meant to be his final stop. He exited his pit box with a full load of fuel and a fresh set of sticker reds to finish the race, but the race remained green. The caution finally flew on Lap 58 when a second car went off-course. This had awarded most of the Top 10 cars the opportunity to pit as well, so Pigot’s stop one lap prior would be of no extra benefit after all. – Pigot was shown in 10th, but was commanded by Race Control to drop to the back of the field due to an unsafe release on his previous pit stop. He took the opportunity to pit for fuel to ensure he would be good until the end of the race, stopping on Lap 64 with the restart coming one lap later. Pigot was the last car on the lead lap but picked up one position when Tony Kanaan had to make another pit stop in the closing laps. Pigot finished 17th. – Ed Carpenter Racing’s transporters will leave Alabama and head immediately for the West Coast, followed by the No. 20 and No. 21 crews early in the week. The Acura Grand Prix of Long Beach will take place next weekend in the streets of Long Beach, California. The race will be broadcast live at 4 p.m. ET on Sunday, April 14, 2019 on NBC Sports Network.